I have to say, we’re pretty lucky down here in Jacksonville. 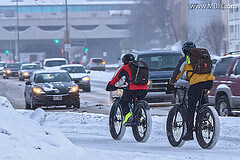 The weather is typically balmy and we don’t have to deal with the salt, dirt and ice on the roads. Elsewhere in the country, bikers aren’t so lucky. Here are a few types to keep your bike, and body, healthy when biking in less than ideal conditions. I know my fixie heads will get behind me on this one, but having a single speed, whether fixed gear or not, will ease your winter commuting. Although derailleurs are a wonderful comfort, the muck on winter roads can get into the gears and ruin a beautiful bike. So when the roads get bad, I recommend putting the race bike in the garage and riding a used single speed. You won’t regret it. Reducing tire pressure will give you a smoother ride and give you better floatation through snowy conditions. Additionally, with winter comes unstable whether conditions. When it is cold, the pressure in your tires contracts. Be careful when pumping your tires in the winter because if you fill them too much when it is cold, the tires may pop when the bike is brought inside or the weather warms up. This may seem like a no brainer, but it is the single most difficult and effective method for preserving your bike through the winter months. When you arrive at a destination, use a towel to wipe down the frame and components to assuage rust build up. When biking in adverse conditions, I tend to keep a handkerchief in my bag for this purpose. Don’t forget your chain! Industrial water softeners can be a major boon to the health of local water systems. Even trace amounts of salinity in the water can cause major degradation to pipe systems. Really, anything that is made of metal, (like your bike), can be seriously damaged by salt. Because of the large amounts of water that major manufacturers and businesses use in their day to day activities, they need to be especially mindful of salt content. Having an industrial or commercial water softener in a place of business can alleviate the strain that the winter salt can have on your bike. The Robert B. Hill Company is one company that I learned about while touring the Fat Sand Bike Company and they seem to do an excellent job. As a general rule, please stop using WD-40 on your bike. While it will prevent rust, it tends to build up over time, ruining your components. 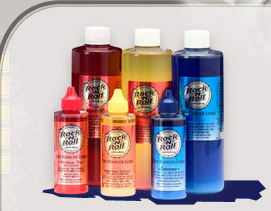 Although it is a little pricy, I have had great luck with Rock N Roll Gold Lube. And heck, the stuff is great in the summertime too! There is no silver bullet when riding in the winter, but any of these tips will make your life better and your bike’s life longer. Don’t forget to dress for the weather. Thanks!